Fasting levels of ammonia (NH3) in blood identify patients at risk for complications of overt hepatic encephalopathy (HE), researchers report in the June issue of Clinical Gastroenterology and Hepatology. Patients with HE might benefit from NH3-lowering therapy. Humans have no repository for excess dietary nitrogen, so we convert excess dietary nitrogen into urea, which is excreted in urine. Urea cycle disorders and acute and chronic liver disease complicated by HE are associated with nitrogen retention. However, it is not clear whether increased levels of NH3 cause HE episodes, or whether its measurement can be used to predict patients who will develop HE. Guidelines state that high blood levels of NH3 alone do not add any diagnostic, staging, or prognostic value for patients with HE and chronic liver disease. Relationship between blood ammonia and the risk of an HE episode. 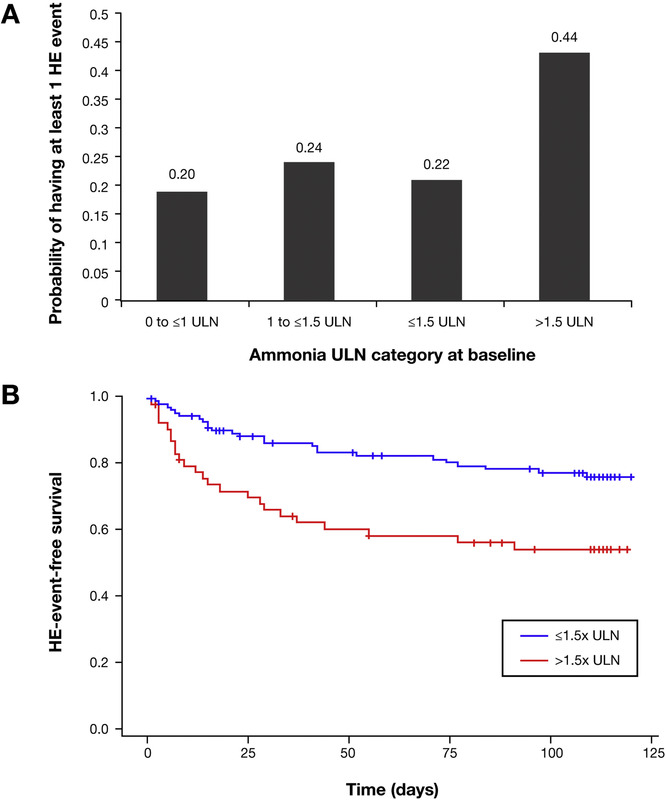 (A) Probability of having an HE episode over the 16-week study period in relation to baseline ammonia levels categorized in relation to the upper limit of normal (ULN). (B) HE episode-free probabilities based on a Cox proportional hazards model for subjects whose blood ammonia at baseline was ≤1.5 × ULN (blue line) or >1.5 × ULN (red line). Blood NH3 is difficult to study, and studies typically report blood levels of NH3 during an HE episode rather than from patients in remission (in the absence of clinical evidence of HE). These are therefore of limited use in predicting the risk of future HE episodes or hospitalizations. John M. Vierling analyzed results from a randomized, double-blind, placebo-controlled phase 2 study of glycerol phenylbutyrate in patients with cirrhosis and HE to determine whether fasting blood levels of NH3 in patients in remission were associated with risk or frequency of overt HE episodes and/or HE-related hospitalizations. The found that the risk and frequency of HE episodes and HE-related hospitalizations correlated with baseline (mean, 51 ± 6 μmol/L; upper limit of normal, 35 μmol/L) and fasting levels of NH3 during the study. Risk increased greatly at levels >1.5-fold the upper limit of normal. Regardless of baseline level, NH3 exposure and the relative risk of HE episodes were decreased by glycerol phenylbutyrate. Vierling et al., explain that although the glycerol phenylbutyrate metabolites phenylbutyrate and phenylacetate have effects other than removal of waste nitrogen, the consistency of the relationship between NH3 and HE episodes and hospitalizations indicates that its observed effect is mediated by reduction of NH3. However, the authors point out that the 178 patients in the study were included because they had 2 overt HE episodes in the prior 6 months, and might not represent all patients with cirrhosis and HE. Also, approximately a third of the patients were taking rifaximin and had higher levels of ammonia at baseline. In patients with urea cycle disorders and HE, exposure of the central nervous system to increased levels of NH3 seems to increase risk for neurologic crises. Vierling et al., state that although they have not defined the mechanisms by which NH3 disrupts central nervous system function, their findings indicate that NH3 is not just a correlate, but a cause of HE, just as it is accepted as a cause of hyperammonemic crises in patients with urea cycle disorders. Vierling et al., propose that fasting NH3 is useful in predicting HE-related morbidity and that patients with chronic liver disease might benefit from strategies to reduce plasma NH3 levels.